Wabanaki – The Wabanaki Confederacy consisted of several northeastern Algonquian-speaking tribal nations including the Mi’kmaq, Maliseet, Passamaquoddy, Abenaki, and Penobscot. The tribes formed the Confederacy after increasing raids by their ancient Iroquois enemies. Their ancestral homelands stretched from Newfoundland, Canada to the Merrimack River Valley in New Hampshire and Massachusetts. 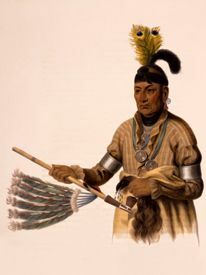 Waccamaw – One of the small tribes formerly dwelling on the Lower Pedee River and its branches in South Carolina and the adjacent border of North Carolina. Nothing is known of their language, and very little else concerning them, as they were never prominent in history. Their associations indicate that they were Siouan. Their habitat was along Waccamaw River, which enters the Pedee from the north almost at its mouth. They were mentioned first in 1715 as living near the Winyaw, both tribes receiving ammunition from the Cheraw, who attempted to gain them as allies of the Yamasee and other tribes against the English. At this time they were living in 6 villages with a population of 610. In 1755 the Cherokee and Notchee were reported to have killed some Pedee and Waccamaw in the white settlements. Like the Pedee, Cheraw, and other tribes of that region, they probably finally incorporated with the Catawba. Waco – The Waco tribe, also spelled Hueco, is a division of the Tawakoni people, who originally lived on the Southern Plains of northeastern Texas. The Tawakoni were a band of the Wichita tribe. Today, many of their descendants are members of the federally recognized Wichita and Affiliated Tribes, headquartered in Anadarko, Oklahoma. Wailaki – An Athapascan tribe or group of many villages formerly located on the main Eel River and its north fork from Kekawaka Creek to within a few miles of Round Valley, California. 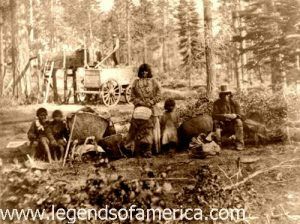 After some fighting with the whites, they were placed on the Round Valley Reservation, where some of them still reside. Their houses were circular. They had no canoes but crossed streams by weighing themselves down with stones while they waded. They lived by the river during the wet months of the year, when their chief occupation was fishing, done at especially favorable places by means of nets and spears. The summer and fall months were spent on the sides and tops of the ridges, where the women were able to gather the bulbs, seeds, and nuts, and the men could unite in deer drives and other methods of hunting. They usually buried their dead but burned those who fell in battle. They took the whole heads of their enemies as trophies, with which they were accustomed to dancing. Like the Yuki, the women tattooed their noses, cheeks, and chins. An adolescent ceremony was held for the girls, and most of the boys were trained with the candidates for medicine-men, who were restricted as to their food, drink, and sleep for many days. Public exhibitions, consisting in part of dancing, were given by the candidates. Large conical dance houses were erected occasionally, and dedicated with ceremonies of dancing and singing; such were important occasions of mingled social and religious character. Many descendants live on the Grindstone Indian Rancheria of Wintun-Wailaki Indians in Elk Creek, California, as well as the Round Valley Reservation in Covelo, California. Walla Walla – A Sahaptin tribe who lived for centuries on the Columbia River Plateau in northeastern Oregon and southeastern Washington, their name is translated several ways but, most often, as “many waters.” The Confederated Tribes of the Umatilla Indian Reservation, located near of Pendleton, Oregon is today home to not only the Walla Walla, but also the Cayuse and the Umatilla tribes. Wampanoag – The Wampanoag people were original natives of Massachusetts and Rhode Island, and it was Wampanoag people who befriended the pilgrims at Plymouth Rock and brought them corn and turkey for the famous first Thanksgiving. Unfortunately, the relationship went downhill from there, and disease and British attacks killed most of the Wampanoag people. Today about 300 Wampanoag people live on a small reservation on Martha’s Vineyard, which belongs to them and is under their control. However, the US government still considers them citizens and controls some of their decisions. Other people of Wampanoag descent live in communities within Massachusetts and Rhode Island. Wappinger – Originally the tribe was located on the east side of the Hudson River between the Bronx and Rhinebeck extending east to the crest of the Taconic Mountains on the border between New York and Connecticut. Except for a few small groups, most Wappinger had left the lower Hudson Valley by 1760 and settled in western Massachusetts with the Mahican at Stockbridge, the Iroquois in New York, or the Delaware in Pennsylvania. Once numbering around 8.000 in 30 villages, disease and warfare eventually wiped out most of the tribe. One possible group of Wappinger remain in northern New Jersey today — the Ramapough Mountain Indians (Ramapo Mountain People). With 2,500 members, they have state recognition but were denied federal status in 1993. Washoe – An indigenous Native American people, the Washoe originally lived around Lake Tahoe and adjacent areas of the Great Basin. Semi-sedentary hunters and gatherers, their tribe name means “people from here.” Today, they are the federally recognized Washoe Tribe of Nevada and California with an approximate population of 2,000. Watlala – Also called the Cascade Indians, they were a Chinookian tribe who lived at the Cascades of the Columbia River and the Willamette River in Oregon. In 1805-06 Lewis and Clark estimated that they numbered about 2,800 and in 1870, along with the Wasco, they had an estimated population of about 3,200. As there were also other tribes who lived at or near the cascades and the people were very changeable due to the location being a popular fishing spot, it was impossible to identify them with certainty. Several other known bands, which may have been the Watlala or later have been included under them, included the Cathlakaheckit, Cathlathlala, Cathlayackty, Clahclellah, Katlagakya, Yehuh. In 1829, the Native Americans of the region suffered an epidemic which was called “ague fever,” of unknown nature, which killed in a single summer, some four-fifths of the population. Whole villages disappeared and those that were left were consolidated. After the epidemic, the Watlala seemed to have been the only remaining tribe, the remnants of the others having probably united under that name, though they were commonly called Cascade Indians by the whites. In 1854 they were reported to number only 80 people, and in 1855 they joined in the Wasco Treaty under the name of the “Ki-gal-twal-la band of the Wascoes” and the “Dog River band of the Wasco,” and were removed to the Warm Springs Reservation in Oregon. Afterward, they were no longer enumerated separately and of those that didn’t join the Wasco, were thought to have joined the Wishram tribe. Wea – The name Wea is a shortened version of the many recorded names, such Wawaagtenang, “place of the round, or curved, channel”, or Waayaahtanonki, “place of the whirlpool,” and others indicating where they were first seen by the Europeans. 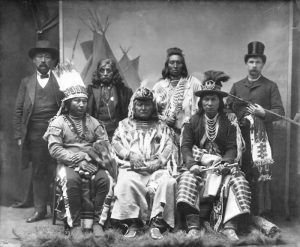 A sub-tribe of the Miami Indians, they were first mentioned in Jesuit relations in 1673 as living in eastern Wisconsin. However, they were later said to have occupied land in Indiana. They also had villages in Illinois and Ohio. In 1757, the Wea had aligned themselves with the Piankashaw and were trying to come into friendly relations with the whites. Subsequently, various agreements of peace with other tribes and the whites were entered into, which in 1854 lead to a treaty that confederated the Wea with the Kaskaskia, Peoria, and Piankashaw tribes. They were then moved to Kansas before again being forced to move to Oklahoma, becoming the Peoria Tribe of Oklahoma. However, not all of the Wea people moved with the rest, remaining in Indiana. Today, the Wea Tribe of Indiana is a state-recognized tribe located in Clinton, Indiana. Wichita – A Caddoan speaking people of Kansas, the Wichita lived in villages of grass huts resembling haystacks. 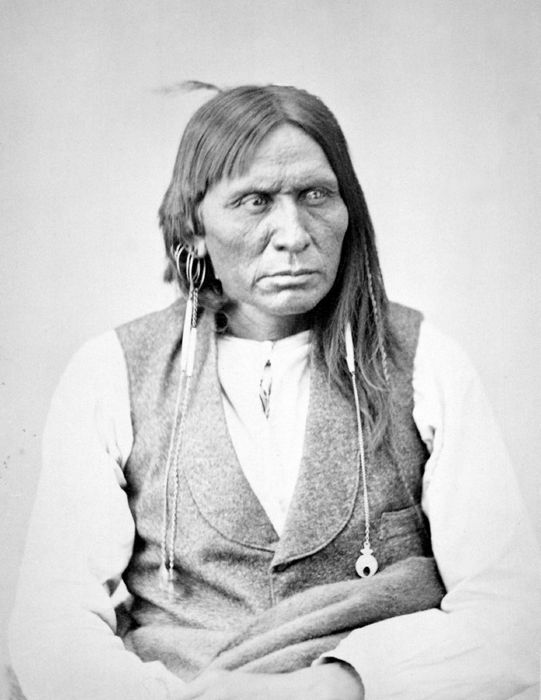 For most of the year their economy was based on farming, but during the buffalo hunt they were nomadic and lived in teepees. After a defeat at the hands of the Spanish in 1662, the Wichita moved south into Oklahoma. In the mid-eighteenth century, they also migrated to Texas under pressure from the Osage. Today, the Wichita tribal lands are centered around Gracemont, Oklahoma with their tribal headquarters in Anadarko. Naw-kaw, a Winnebago chief I.T. Bowen Lithographic,1836. Click for prints, downloads and products. Wiyot – The Wiyot are original people of Northern California, where their surviving descendants still live today along with Wiyot descendants live together with Yurok, Hupa, Tolowa, and Mattole Indians on four rancheros. These California Indians have partial control over the rancherias and each tribe has its own government, laws, police, and other services. However, the US government still considers the Wiyots citizens and controls some of their decisions. Today, since the rancherias comprise Indians from several different tribes, they are ruled by tribal councils which represent all the ethnicities of each rancheros. Wyandot/Huron – The Wyandot or Huron are an Iroquoian-speaking people made up of a number of bands, whose ancestral lands were in southern Ontario, Canada. They later moved to Michigan, Ohio, Kansas, and Oklahoma.